I moved to Edinburgh a few years ago, and when I did I left a couple of boxes’ worth of clay sculptures in London. A couple of months ago I finally got managed to bring most of them up to Scotland with me. I guess I’ll try to sell most of them; some could probably make good Christmas presents for people, and so on. I’m still pondering prices. It was fun, in any case, just taking all my old sculptures out, laying them on the mat and getting photos of them. I think I’d missed them a bit, without really being conscious of it. I miss working with clay; I’m currently trying to find somewhere in Scotland where I can go for a couple of hours or something, every now and then. Every week, maybe. There are just so many things you can do with ceramic clay that you can’t really do with polymer, and I want to be doing some of them! 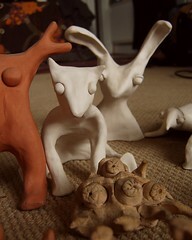 I also have a box of unfired clay sculptures still left in London, including most of The Bunny Mob (only the original, Alfonso di Bunniti, is here with me in Edinburgh) which had been sitting on a never-touched shelf all these years, but have now needed to be moved, and some of them got broken. I’m not sure how I’ll fix them and get them fired, but I guess I’ll get something figured out sooner or later. Sooner, I hope.